4.3 out of 5 based on 248 bloggers and 85 commenters. 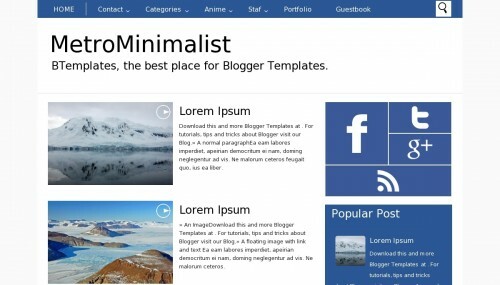 MetroMinimalist is a free blogger template with 2 columns, right sidebar, minimalist, an exclusive design for Blogger, footer columns, social bookmarking icons, posts thumbnails, breadcrumbs, well designed threaded comments and simple look. Excellent template for blogs about any general topic, internet or photography. How to change the backgroud color of any gadget ?? Hi, Any chance someone knows how can I resize the featured images size on home page. Hay the same problem was happen to me, I dont know how to change the widget background, there are some one can text me about how to change the colour of the widget? Sailesh open template layout and SEARCH for facebook. You will see a # symbol in place of link; put you Facebook page link there. Same way search for Twitter and all. Have backup of template so you don’t loose all customization in case you make a blunder. See my blog I have put those links there. 80% – I want some responsive theme…It’s perfect, but miss be responsive. Nice template I used it on My blog thanks. How do you put the image where “No image available” is? Now thats what I call a template! w nggak punya fan page di facebook, lok misalnya mau diganti script share ke facebook. gimana caranya bro. Can anyone tell me how to make a picture from the text appear as a thumbnail on the main page? Now I have ‘no image available’, while there are many photos in each text. Help, someone, plz. Hi there. Can someone, pretty please, help me with ‘no image available’ on the main page, while there are many photos in every text? I’d like a photo always to be there for every text on the main page. What to change in HTML? this is a nice site..
Excelente, muy bonita y facil de instalar, gracias!